-1. Aseptic diaphragm valve has unique sealing structure, eliminated the hygiene corner, it is in favor of medium automatic emptying and more conducive to CIP/SIP process. -2. According to the structural characteristics of aseptic diaphragm valve: recommend 15-30 degrees of installation (according to different specifications), it is good for the valve fully discharge after cleaning, will not cause liquid stopped inside of the valve easily. life of the diaphragm. The surface of valve cartridge can be mechanical or electrolytic polishing according to customers’ requirements, PO can reach 0.25um. medium, such as fibers, solid particles, catalytic material and so on. Generally it will not affect the sealing and working of the valve. You can choose different materials according to the temperature of working and the chemical properties of working medium. -5. 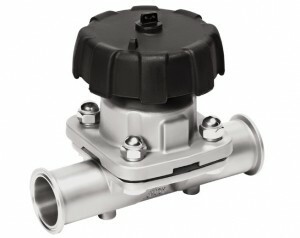 Due to different working conditions, we will choose different types of valves and materials. The operation of the product needs to be analyzed before choosing the body and diaphragm of the aseptic diaphragm valve, especially for the use of chemical medicine and the chemical reaction caused by high temperature. Testing the suitability of materials through effective chemical data or certification of experts. To ensure the safety and long-term effectiveness of the product. fixation, this way of fixed spread stressed are to the entire area of the bolt, this is prevent the damage of diaphragm mechanical connection in vacuum conditions.